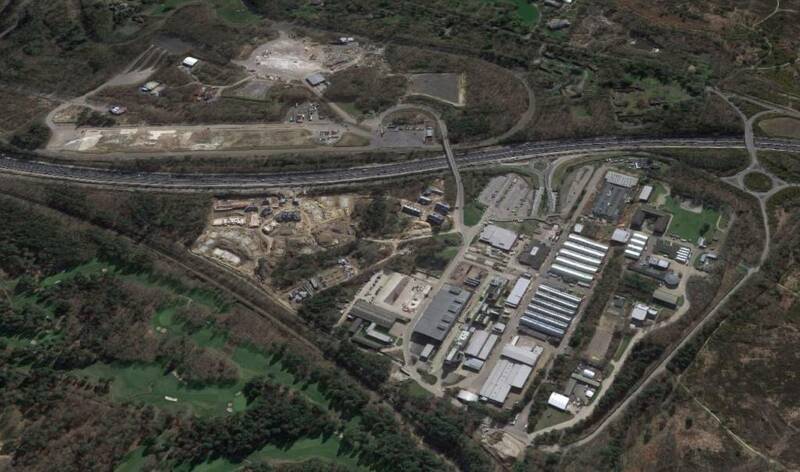 Hughes and Salvidge have completed the role of Principal Contractor for the demolition works at Longcross Studios. The structures earmarked for demolition included several buildings, some tanks, a boiler house, and 3 chimney stacks located adjacent to a live substation. Across a 200-plus acre site, we completed works including the treatment and disposal of radioactive materials, asbestos removal, a comprehensive soft strip to multiple buildings, the demolition and removal of all structures within the demolition scope, and the crushing and disposal of the resultant concrete/brickwork. We encountered many constraints on the site throughout the duration of the works and ensured we had relevant and required risk assessments in place to mitigate the potential for any harm or damage. Beneath an old filling station there was hydrocarbon present and the possibility of other contaminants. Areas of the site had also previously been used by the military and there was the possibility of unexploded ordnance in the ground. The main constraint we encountered was the Studios were fully operational throughout our works, including filming of Murder on the Orient Express, Call the Midwife, Kingsman 2: The Golden Circle and Star Wars: The Last Jedi. Many of these productions required open air sets and disruption from dust and noise was a real concern for the client, the studio and ourselves. We ensured that working hours were agreed and adhered to throughout. Our traffic movements, for delivery and waste removal, also adhered to strict timings in order to not cause disruption to production. Hughes and Salvidge completed the works to the full satisfaction of all stakeholders.